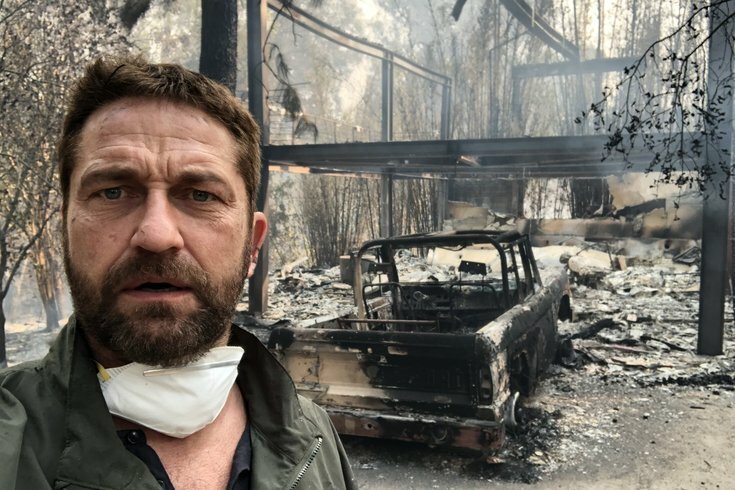 Gerard Butler takes a selfie outside of his nearly destroyed home in Point Dume in Southern California. Gerard Butler refers to his neighborhood as a “war zone” in a new video he posted to Twitter Monday afternoon. The "300" actor walks through his Malibu neighborhood, Point Dume, and films the destruction brought on by the Woosley Fire. "It's heartbreaking. Every house after a certain point is gone," he says in the video. He notes that a friend’s house was reduced to ashes as he walks through the street filled with empty and destroyed lots. Butler posted a picture of his nearly destroyed home on Sunday. Hundreds of people have lost their homes to the fire which began around 2:30 p.m. on Thursday. Miley Cyrus, Scott Derrickson, Robin Thicke and Neil Young were all among those whose houses were destroyed by the fast moving blaze which burned over 91.572 acres. Mandatory evacuations orders are still in effects for Malibu, Calabasas, and Hidden Hills. The fires in both southern and northern California have claimed the lives of 31 people. 228 people are still missing in northern California, and over 250,000 people are displaced from evacuations.